The Salvation Army announces that Emergency Disaster Services [EDS] personnel and volunteers are responding to the current lava flow in Leilani Estates with meal coordination, hydration, and emotional and spiritual care at the shelters in Pāhoa and Kea‘au, with clothing vouchers distributed at Recovery Information Assistance Centers [RIAC], and, starting Tuesday, May 15, 2018, oversight of a distribution center for basic needs items in Pāhoa for those affected by the Puna lava flow. Food and water donations continue to be directed to partner agencies such as Food Basket and clothing donations to The Salvation Army’s three Hawai‘i Island thrift stores. DISTRIBUTION CENTER VOLUNTEERS – Volunteers are needed to help sort items and staff the distribution center that is scheduled to open on Tuesday, May 15. For additional details and to sign up to volunteer, visit hawaii.salvationarmy.org and click on the “volunteer” option button on the main page. Current volunteer opportunities can be viewed by entering a local zip code by island. FOOD DONATIONS – Juice boxes and kid-friendly food items are requested along with the continued requests for cases of bottled water and food donations. Also, requests are coming in for garbage bags. Donations of all these items may be made at Food Basket, Hawai‘i Island’s Food Bank, at 40 Holomua St. in Hilo and 73-4161 Uluwini Pl. in Kailua-Kona. For details, call (808) 933-6030. CORPORATE CONTRIBUTIONS – We’re also pleased to announce that Kaiser Permanente has made a $10,000 contribution to support The Salvation Army’s EDS efforts in Hawai‘i. See previous support listing below along with additional ways the public can make donations at businesses across Hawai‘i. MEALS SERVED – Mahalo to Latter Day Saints Kaumana, Strato’s Pizza, Connect Point Church Hilo, Keiki Carnival [Big Island Substance Abuse Council], Sure Foundation Puna, The Salvation Army Hilo Temple Corps, Seventh Day Adventist Hilo and Puna, Sergio Lunch Wagon, and Hilo High School Football Team for their food donations and volunteers for meals at the shelters on May 11, 12, and 13. 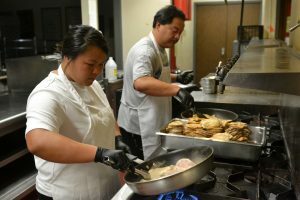 MEAL DONATIONS –The Salvation Army continues shelter meals and seeks large volume meal donations from local restaurants and certified kitchens [due to health safety food preparation standards] for meal service at shelters in Pāhoa and Kea‘au. Contact The Salvation Army at (808) 756-0306. THRIFT STORE VOLUNTEERS – Additional volunteers are needed to help sort through clothing donations at The Salvation Army’s thrift stores in Honoka‘a, Hilo and Kailua-Kona. For additional details and to sign up to volunteer, visit hawaii.salvationarmy.org and click on the “volunteer” option button on the main page. Current volunteer opportunities can be viewed by entering a local zip code by island. CLOTHING VOUCHERS – The Salvation Army is providing clothing vouchers for those impacted by the current lava flow. Vouchers are distributed at disaster RIACs that are established. EDS AWARENESS EVENT IN HONOLULU – The Salvation Army EDS Awareness Event in Downtown Honolulu – It’s National Salvation Army Week and The Salvation Army had already planned to hold an EDS Awareness Event in downtown Honolulu this Friday, May 18, from 11 a.m. to 1 p.m. at Tamarind Park on the corner of Bishop and King Streets. There will be information about Emergency Disaster Services checklists for you and your family, volunteer training opportunities, and general information about The Salvation Army, among other items. Monetary donations to support The Salvation Army’s EDS response efforts across Hawai‘i also will be accepted via Red Kettle and via a link to our donation webpage at hawaii.salvationarmy.org. 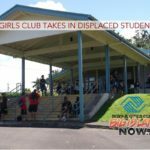 • Bank of Hawai‘i – Bank of Hawai‘i announced that donations to The Salvation Army’s EDS efforts can now be made at any of Bank of Hawai‘i’s 69 branches across Hawai‘i, the West Pacific Region and American Samoa. 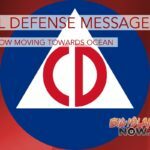 • Central Pacific Bank – Central Pacific Bank announced its 35 branch locations will be accepting monetary donations to benefit Hawai‘i disaster relief efforts. Monetary donations will be accepted through May 31, 2018 and will go toward The Salvation Army’s EDS efforts in Hawai‘i, with the opportunity for customers to designate support of either Hawai‘i Island or Kaua‘i relief and recovery efforts. • First Hawaiian Bank – Aloha for Hawai‘i Fund to support The Salvation Army’s relief efforts for the Kīlauea Volcano Eruption on the Big Island and recovery efforts for flooding on Kaua‘i and in East O‘ahu. Donations can now be made at any of First Hawaiian Bank’s 61 branches located in Hawai‘i, Guam and Saipan. • Foodland – “Aloha for Puna & Pāhoa” Disaster Relief (The Salvation Army). Customers will be able to make monetary donations at all Foodland and Sack N Save stores and Malama Markets in Hawai‘i in $5, $10 or $20 amounts beginning May 9. Donations will go towards The Salvation Army’s EDS efforts. • HiLife – Kokua Collection – A percentage of the proceeds from various HiLife clothing items in their Kokua Collection will be donated to Salvation Army Hawaiian and Pacific Islands division to assist with their relief efforts to victims of recent devastating floods on O‘ahu and Kaua‘i as well as erupting volcano on Hawaii island. For details, visit https://hilifehawaii.com/collections/kokua. Those wishing to donate food, juice boxes, and bottled water should contact Food Basket, Hawai‘i Island’s Food Bank. They are located at 40 Holomua St. in Hilo and 73-4161 Uluwini Pl. in Kailua-Kona or call (808) 933-6030. The public is encouraged to support the emergency disaster services efforts via monetary donations at www.hawaii.salvationarmy.org. One-hundred percent of the donated funds will support The Salvation Army’s emergency disaster services in Hawai‘i.